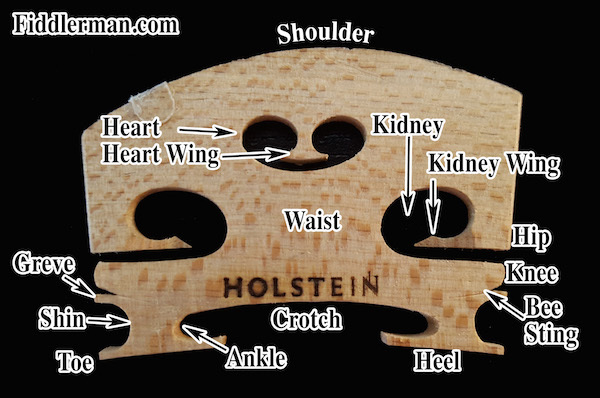 One of the most vital components of a stringed instrument is its bridge. Most aspects of a bridge are modified to improve the overall sound production. The bridge is first shaped starting with the heels (feet) then thinned. The Kidney Wing and the Heart Wing are often tapered to a thin end. The Crotch is often trimmed upward and the size of the Kidneys are usually increased. The top shape of the bridge is generally cut to mirror the shape of the fingerboard. Players have unique preferences based on experience, their habits, and how much they like to change the angle of the bow when crossing strings. A misconception is that a flatter bridge makes it easier to play double stops. In order to play double stops you need to play 2 strings at once which can be just as easily achieved regardless of the bridges curve. The difference in the curves relate specifically to the distance of travel to change strings. Great description of the bridge. I am so glad you mentioned about a bridge being more flat for double stops. That is one of my pet peeves.